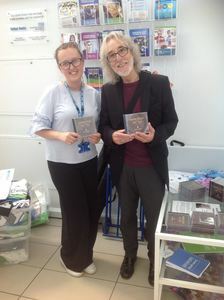 Welcome to a special HEARTSONGS news page, the main thrust of the news being the release of the album HEARTSONGS created and developed over several months as a fund raising album for the Birmingham Hospitals charity. It has been my privilege to record and release many albums over the past half-decade. All have been important to me, but none so quite as much as this release. 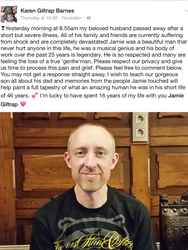 Not just for musical reasons but for powerful and heartfelt life affirming reasons. 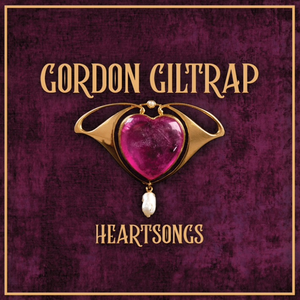 First of all I thought it might be a good idea to add a few tracks that weren't on the original album, and it was then that I thought maybe I could put on as an opening track the all-star version of Heartsong dating back to the 1993 recording. It was then that I came up with the album title HEARTSONGS. I then had in the bag a cracking live recording of 'The Dodo's Dream' recorded at St John's Church in Chichester virtually 12 months ago. The wonderful Mike Stranks had captured that performance, and ironically I was using a no name Chinese Strat copy that sounded sublime. 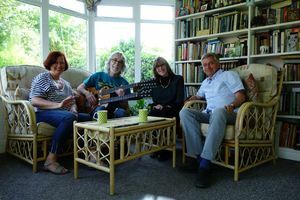 The tail end of last year I was commissioned to write a tune for Pete Bonner's wife Linda for her birthday. It was Pete who released THE LAST OF ENGLAND on vinyl. 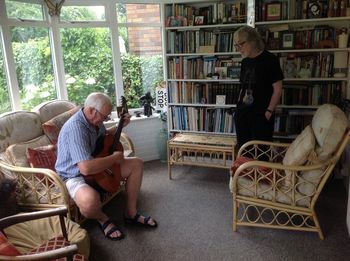 The tune turned out well with some nice additional strings and piano from Stuart Jones a friend of Pete and Linda's, so hey presto another potential track for the album. 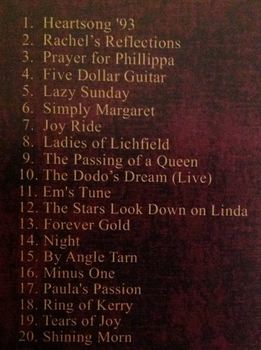 The title ‘The Stars Look Down on Linda'. So, even though the album is a re-release it does have those extra tracks that weren't on there before. More details on the background to this release can be found HERE. We then move on to the albums design. I was wracking my brains for an idea, then it occurred to me that a beautiful Art Nouveau brooch that I bought my beloved Hilary many years ago might make a striking cover design. Next job was to find the right person to design the cover, and this is where Gavin Morrow comes in. Gavin did a stunning job of the design work for the vinyl release of The Last of England and so he was recruited to do the job. 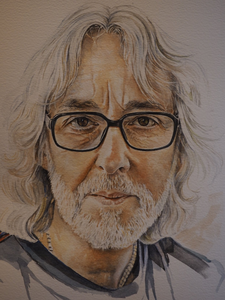 At this point I want to thank the following people who contributed financially to the albums creation: Pete Bonner who paid for the artwork, Chris Abrams who covered the cost of the manufacture, Paul Ward for mastering the album, Mark and Jane Day for creating stunning A4 and A3 posters, Mike Stranks for the recording of 'The Dodo's Dream', and Stuart Jones for his strings and piano on 'The Stars Look Down on Linda'. There are various photos on the inner sleeve. One taken by Hilary of me in the foyer of the hospital just a few weeks after my initial surgery, and a beautiful picture of Jamie, Braden and I taken in 2015 once again by Hilary. On the back of the CD is a photograph of myself with my surgeon Mr Samuel Ford, a truly beautiful and gifted man. On the day that the photograph was taken I told him that 'I owed my life to him'. His reply was something along the lines of 'no Gordon, I just did my job and you got better'. The first 100 ordered will be signed by myself on a dedicated signing page bound in to the book. Please note: For logistical reasons it will not be possible to include personal dedications along with the signature - sorry folks! 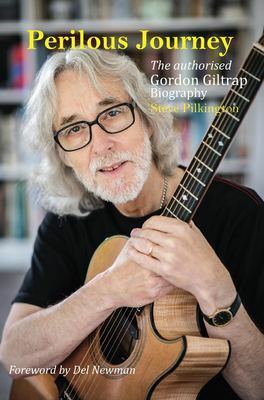 My concert with Nick Hooper in Bishops Itchington was an absolute joy, and although the place wasn't heaving it was a pleasant time all round. I get a great deal of pleasure working with other people as you folk who follow my career full well know. 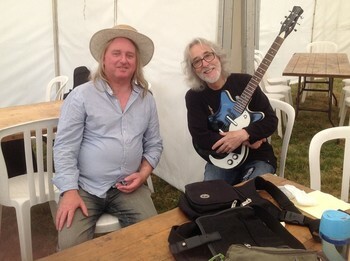 It’s just great feeding off another musician’s energy, it also keeps me on my toes and keeps me fresh. Nick is such a fine player and composer and I enjoy working out parts that as near as dammit fit with what he has written. On the evening we were using our matching custom Fylde guitars, and my model (which Nick's is based on) is sounding as glorious as ever after years of playing and recording. The sound system in the church is a good one and although churches by their very nature are very echoey the sound was sublime. So good to have old friends Sue and Mike Holton there, who planned their holiday around the gig date so they could attend. Sue was there with her trusty camera to record the event, and some of the pieces are now on YOUTUBE HERE. Special thanks to Sue and Mike along with Malc Welch and Karen for their help on the night and to Martin and Louise Green for making it happen. 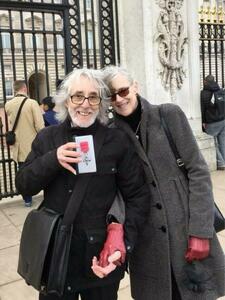 Also nice to see old friends Keith and Fiona Meredith in attendance. Keith usually writes superbly worded reviews of my gigs, so let's hope he does another one for this event. 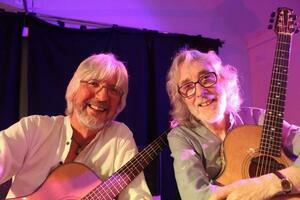 What a joy and a privilege it was to also have the great Nick Hooper as my June SHARING DAY guest. For me it was the most enjoyable and satisfying Sharing Day I have experienced for a quite a while and the turnout was amazing with about 15 players lead by my helper for the day past GG student Mark Guyatt. 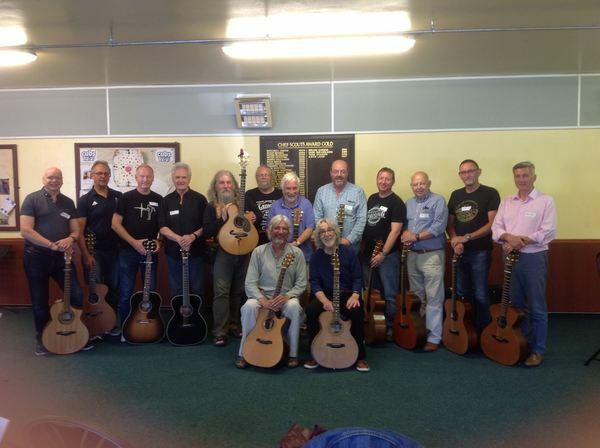 To hear HEARTSONG playing by massed guitars was quite a mighty sound indeed. Hilary and I had a wonderful time at West Fest in Malvern. 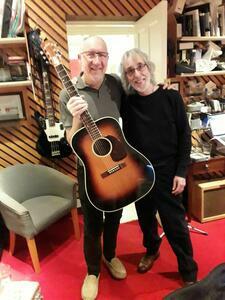 Here I am cuddling my current favourite guitar a black Danelectro sat next to my dear pal Ray Mytton. Sadly the football reduced the numbers but I do hope it continues next year, and if it does I shall be there if they will have me! Great to have Carrie Martin with us again for a few days recently. 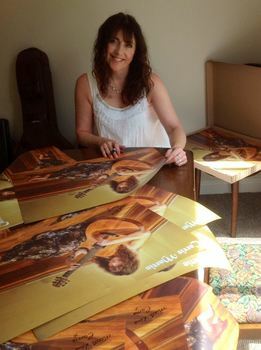 Here is the lovely lady signing posters for the upcoming vinyl release of her album Seductive Sky. 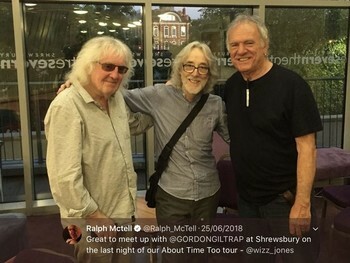 Great to see these old pals again recently. Both in fine form and great spirits. 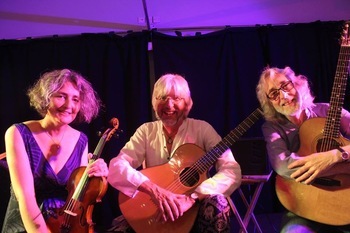 I can't begin to tell you what a great time I had playing with these two outstanding musicians, Nick Hooper and Judith Henderson. Judith's fiddle playing adds a powerful depth and dimension to the music, especially old favourites like Maddie Goes West. Here's to the next time my friends. 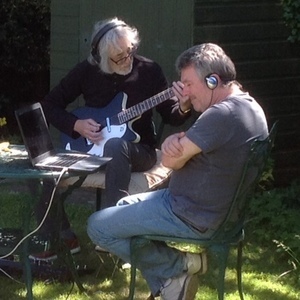 Here I am in the garden recording 'The Dodo' with that genius Paul Ward, you can't get better than that! 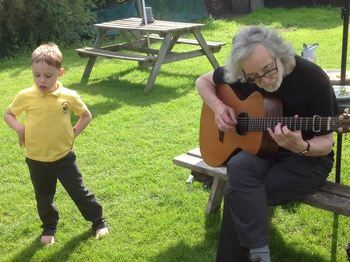 What a joy and a privilege to play for my grandson's school. Here Braden and I are in the garden of a local pub after the gig.